Series of digital ads designed for Foxtel whilst working at Melbourne agency CHE Proximity. Foxtel was a major client, and I worked on many different digital campaigns designed to drive sign up of new customers. I worked as part of a large team including copywriters, project managers, account managers, the head of digital, creative directors and animators. Each campaign would already have a visual style which was designed by another section of the agency. My job was to take the creative assets and design a wide range of digital banner ads including MREC, half page, leaderboard, gutters and page takeovers. I designed the concepts for the banner’s animation frame-by-frame, then provided annotated documentation to the in-house animators who brought the ads to life. We also designed micro-sites for every campaign. All banner ads and emails would direct potential customers to the micro-page where there would be more information relevant to the promotion. For some projects I worked as the sole designer, and our head of digital would oversee the work. Towards the end of my time at CHE, I would supervise junior designers as they designed the content. Designed at CHE Proximity, Melbourne, 2014-15. Foxtel $25 a month promotion: MREC banner ad (300x250px). 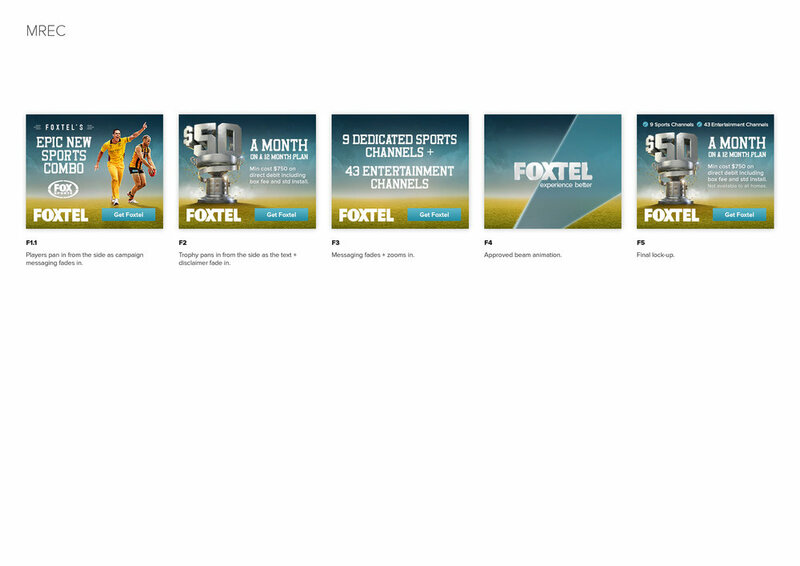 Foxtel $25 a month promotion: leaderboard banner ad (728x90px). Foxtel $25 a month promotion: skyscraper banner ad (160x600px). The Roar page takeover: MREC and leaderboard banner ads, plus gutters. Foxtel Sports campaign: MREC banner ad (300x250px). Foxtel Sports campaign: leaderboard banner ad (728x90px). An example of the concepts, as presented to the client. Annotations explain how the animation will work for each frame of the ad. A micro-page for a $50 Sport + Entertainment package. For every campaign the agency would design a micro-page which all of the banner ads and emails would direct traffic towards, to encourage new customers to sign up.